If you look at the last few Longines we’ve written about, you’ll immediately notice that they are all part of the Heritage collection, the tribute watches to Longines’ great history. 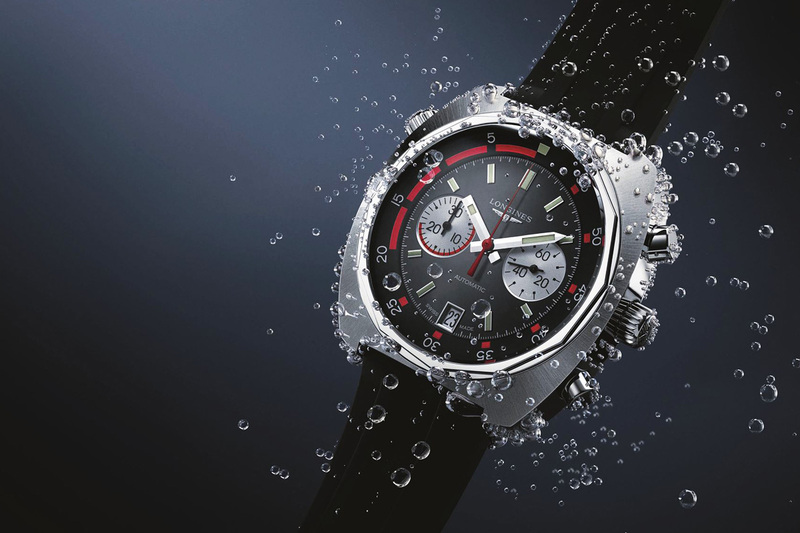 For instance, we’ve presented you with the Heritage Diver, honoring 1970’s diving watches; the Conquest Heritage, a faithful re-issue of the original 1954 Conquest; and the Heritage 1973 that recalls the iconic 1970’s racing chronographs. 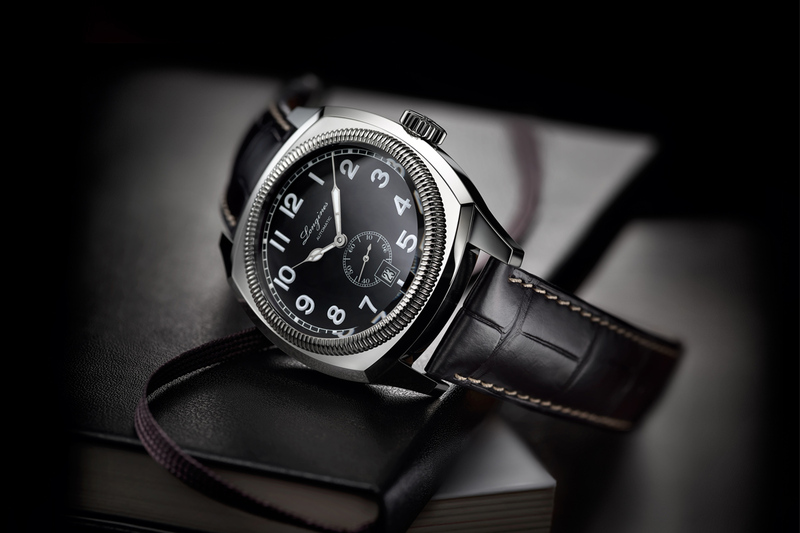 At Baselworld 2014, Longines introduced another interpretation of a historic watch, a tribute to 1935 Czechoslovakian pilot watches, the Heritage 1935. 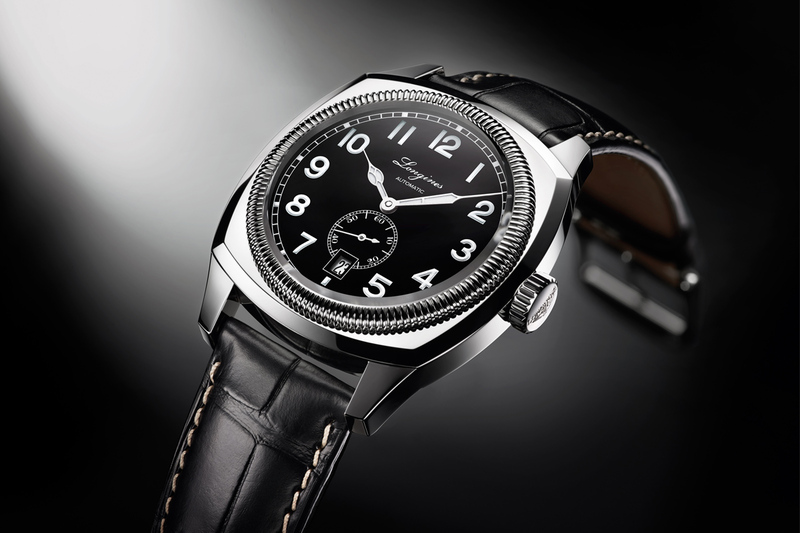 Let’s look back at the Longines Czech Pilot and compare it with the new Longines Heritage 1935. IIn between the two World Wars, plenty of watch brands supplied timekeeping tools to military forces. These included Glashütte Original or A.Lange & Söhne and their now famous, and overly copied, B-Uhr Flieger watches. 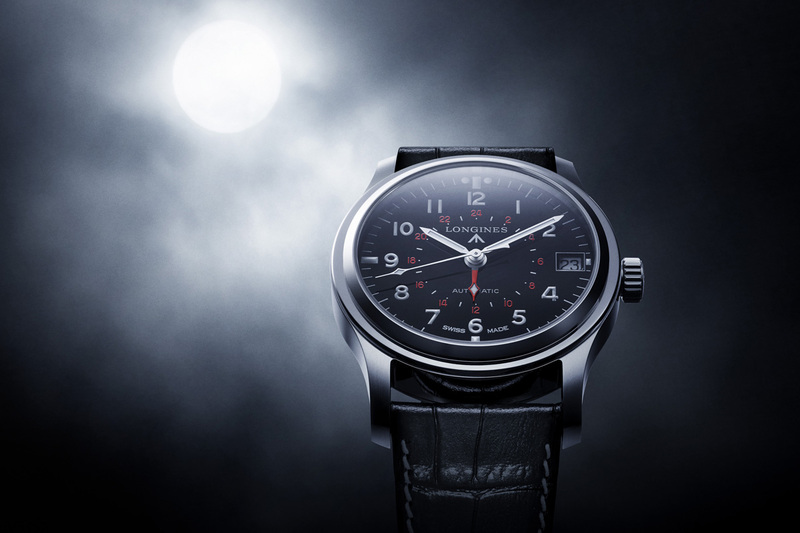 Longines also supplied to the military forces – the Czech Air Force to be precise. That watch is now known as the ‘Majetek Vojenske Spravy’ (reference to the markings on the case-back). 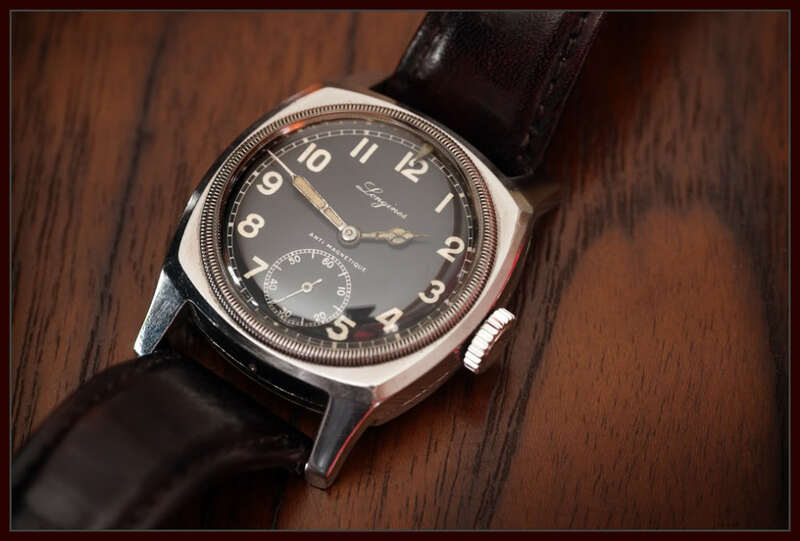 Developed in the late 1920′s, these watches were part of the standard equipment for Czech pilots during the mid-1930′s (several brands had been supplying pilot watches until 1935, when Longines took over that niche). Even now these old watches, which have reached an age of 80 years, are still very appealing, with specifications and a design that can be called contemporary. “Familiar” could be the word to describe the Czech Pilot watch. First the case: a 40mm cushion shaped case made in stainless steel, and a size that most of us would qualify as ‘reasonable’ nowadays, although 80 years ago it was considered HUGE. Even the shape of the case could be part of a modern Panerai brochure. Same goes for the matte black dial (made of porcelain!) and its big white Arabic numbers. The fluted bezel rotates with an internal triangular marker, allowing a very rudimentary timing or GMT function. The only indications to date the watch by are the ‘cathedral’ hands, filled with radium luminescent material, and of course the movement. The 15 lignes (approx. 34mm) movement justifies the size of the watch. Coming from a pocket watch, it features a very nice gilt frosted finish and a singular architecture of the bridges. 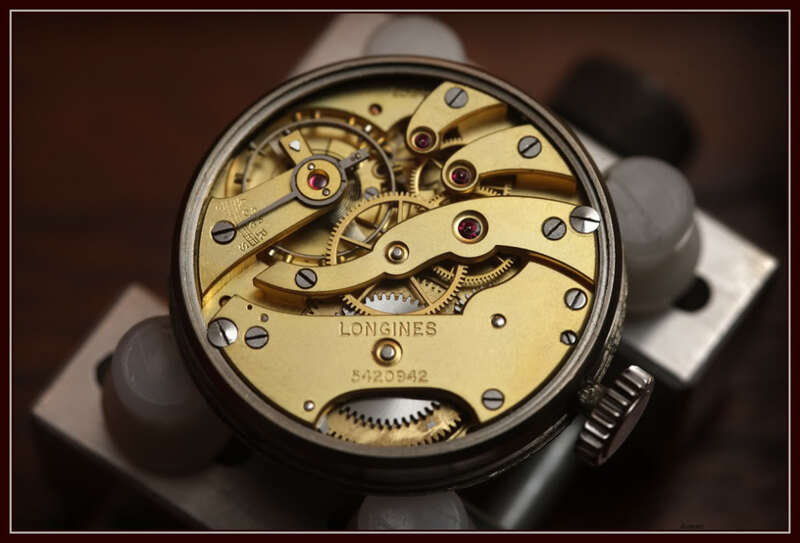 The Longines calibre 15-94 is a big and heavy movement, of course manually wound, and ticks at 18.000 vph. This pilot watch was built to survive a rough life on the battlefield or – with its antimagnetic properties – on a pilot’s wrist in the cockpit. Those pieces are part of the history of the brand and may be quite difficult to find. And if you’re lucky enough to find one in original and decent condition, count on a minimum of € 2.500 EURO. 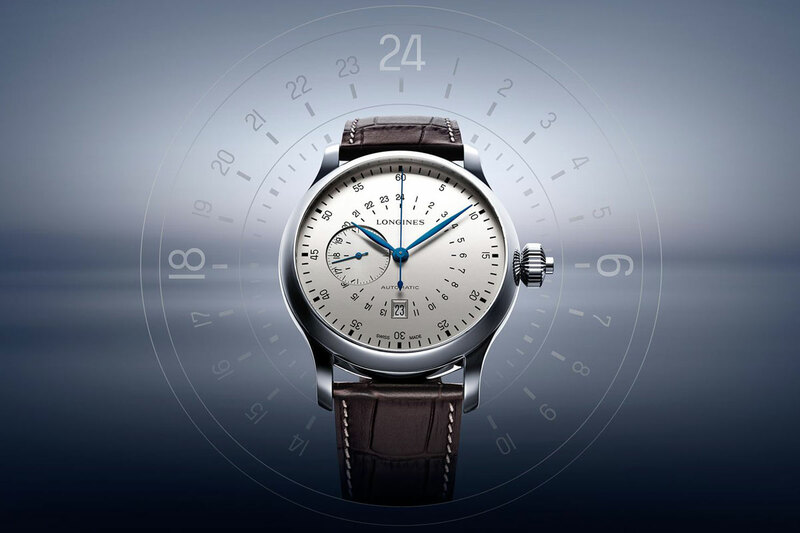 All these elements create a unique mix of vintage feeling and modernity, a very pleasant watch that Longines reintroduces in a faithful tribute. 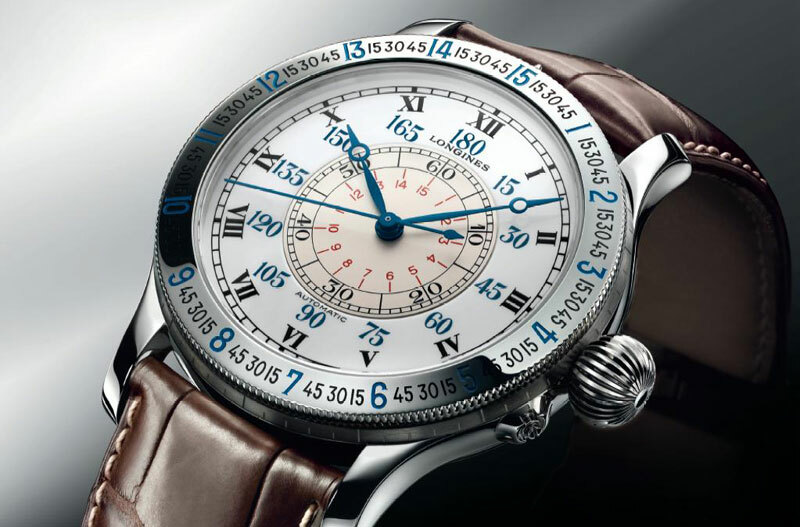 As we’ve said, Longines is very well trained in the re-edition game. Some of their homage pieces are real best-sellers, such as the Legend Diver. The major reason for that success is a steadfast loyalty to the original design linked to modern specifications. And the same goes for the Heritage 1935. First, the case. Even if it has slightly grown from 40mm to 42mm, the shape is a perfect copy of the old version. Same cushion design, same angular lugs, same fluted bezel. Even the big, rugged crown is similar. Seeing one next to the other, the resemblance is obvious. The matte black dial is also very close to the original design. The large white Arabic numbers (with a raised bold design), the old Longines’ inscription, the railroad minutes track around the dial and the small second sub-dial are all part of the vintage-inspired feeling of the Heritage 1935. Even the ‘cathedral’ hands and the small second hand with counterweight are coherent with the Czech pilot watch. A true success at first sight, even with several nods to modernity. 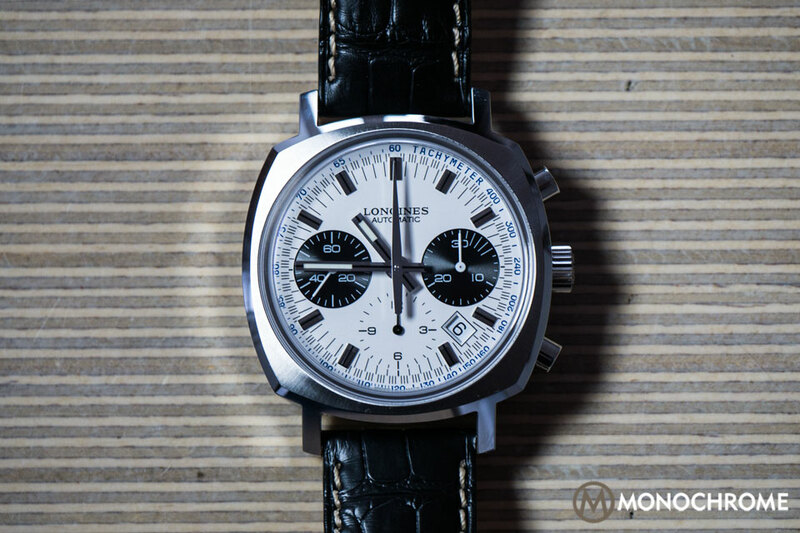 The first difference comes with the lack of the triangular marker, as the bezel is fixed on this re-edition. But to be honest, the functional purpose of such a timing instrument is anymore somewhat outdated and only has a real use in diving watches. The other modernized update is of course the movement. 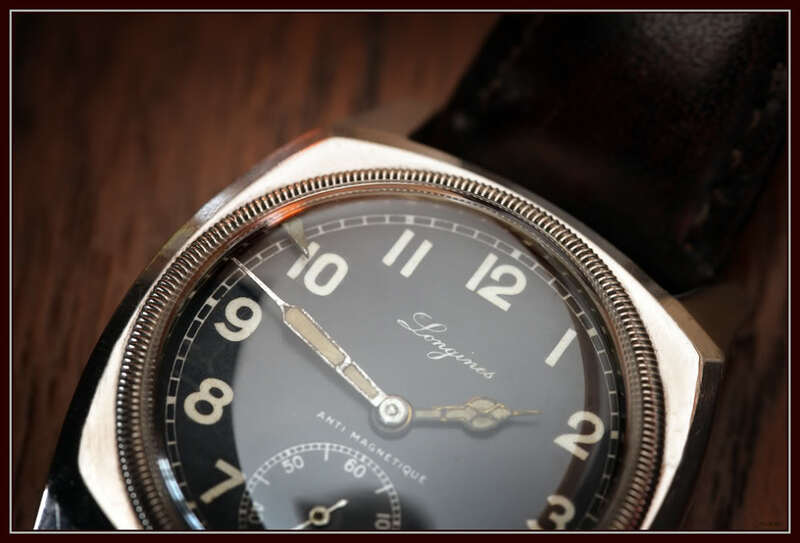 Whereas the older one was powered by a pocket watch calibre, it seems difficult to integrate such a movement in a modern watch, especially for a mainstream brand such as Longines. For cost reasons and for the need of reliability, the Heritage 1935 comes with a robust ETA 2895-2, a self-winding movement that boasts 42hours of power reserve, a small seconds – and, unfortunately, a date function. Not that the date window is disgraceful or poorly integrated, but it has nothing to do with this watch, on an historical basis. We can understand a sapphire crystal or a modern movement. But the absence of this date aperture on the dial would have been more than welcome. 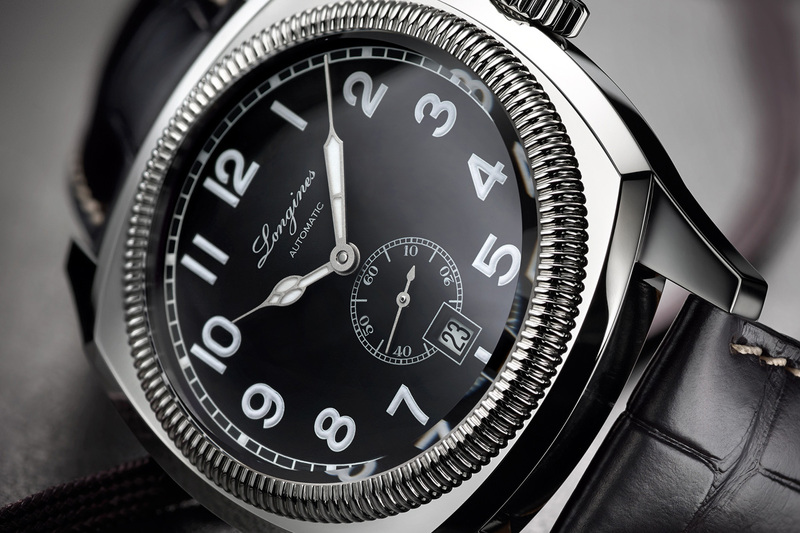 For the rest of its features though, it is again a very appealing watch from Longines. 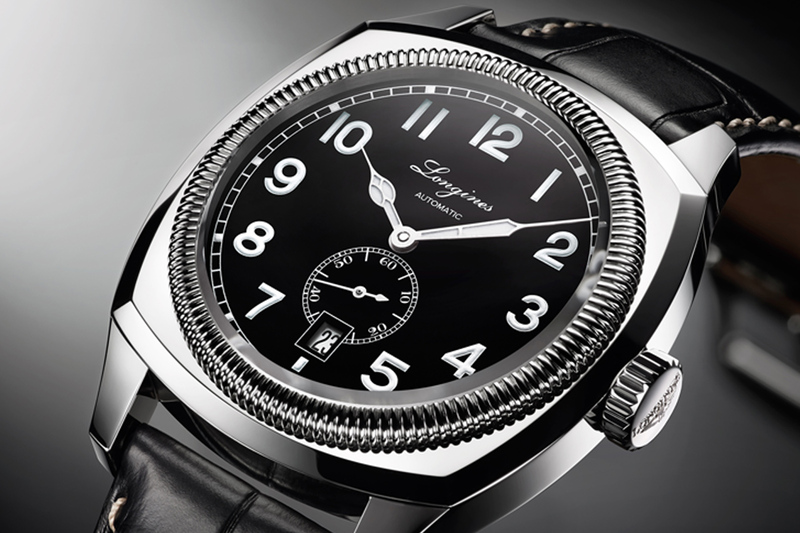 The Longines Heritage 1935 will be available later this year for a reasonable price of EUR1.450. More info on Longines’ website. Many thanks to Duwan for his wonderful photos of the historic ‘Majetek’.